The Aderans Group considers the reduction of environmental burdens such as CO2 emissions as a corporate social responsibility and is moving forward in its efforts for the environment, such as environmental adaptability of its products and reductions of CO2 emissions in its offices. Since 2009, we have been involved in an initiative, dubbed "Fontaine Green Forest Campaign," to plant trees on mountains through the environmental communication company Tuvalu-Forest Corporation. We have run this campaign seven times and have contributed to the planting of more than 1,200 trees in total. ※ Covering area is estimate which is evaluated from number of trees and our ratio of support to environmental preservation groups. Our "Fontaine Forest" project has been recognized by Prof. Wagner from University of Leicester that "it is a very unique activity which successfully has both aspects of social contributions and sales, along with sustainability" and also by British business journal as aprecedent case. Through pursuing to provide our customers the best technology and high quality products, we ensure we minimize the environmental impact of our products, wigs, at the waste disposal site. We are committed to responsible business practice and accountable for our products to the extent of their disposal to our customers and societies. From 2016, we expanded our "Fontaine Green Forest Campaign" tree-planting activity. Also we started supporting the NPO Sakura Namiki Network. 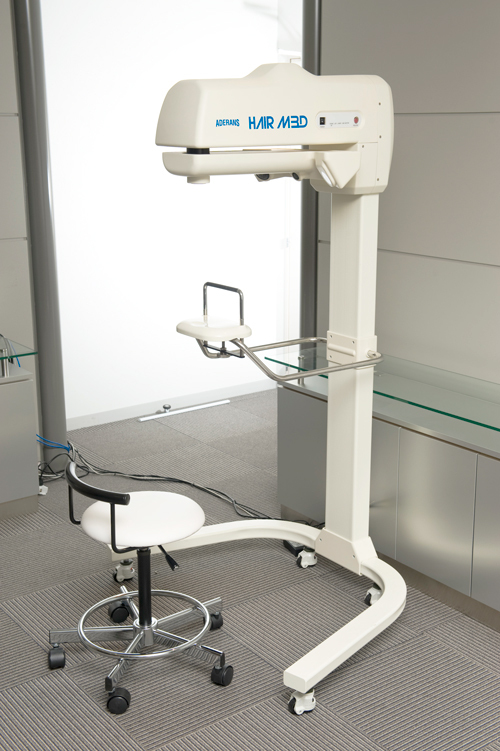 By taking advantage of Aderans strength, our nationwide sales office, we are planning to expand our support for environmental conservation all over Japan. 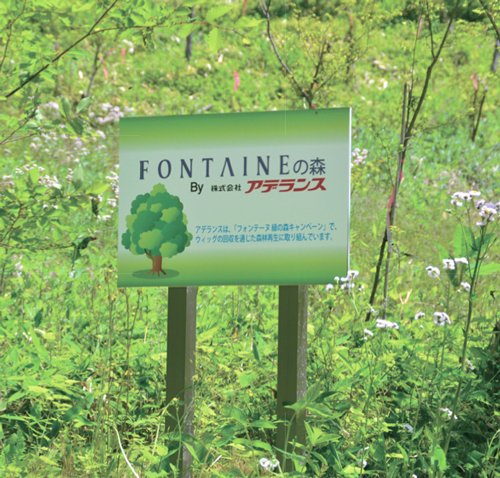 Nationwide Activity, "Green Forest Campaign"
From 2017, we will expand our "Fontaine Green Forest Campaign" tree-planting activity into 7 area in Japan. We will save beautiful nature in Japen for our descent. Impressed by the movie "Pay It Forward", we are promoting our own hair club volunteer activity that will spread kindness by expanding feeling of gratitude instead of returning kindness afterwards when we receive. Hair club staff uses volunteer leave system and participates various volunteer activities, such as food support, foster child support and beach cleanup. 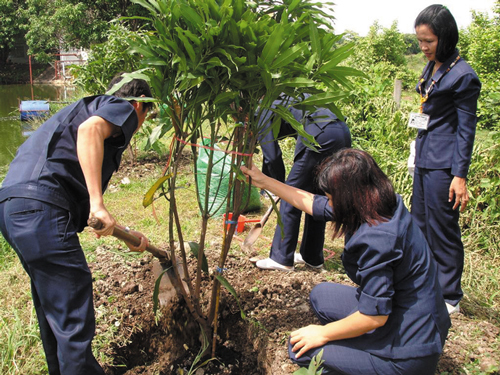 On July 2, 2016, together with teachers and students at Bankasan school, Aderans Thailand TO BE NUMBER ONE club planted 40 trees within the school area at a 2016 forestation event. This event was meant to raise awareness of the environment by through a protection activity for children in Thailand. It was the 12th forestation event this year, starting from 2009. Our Thai factory sell the waste materials produced in the process of manufacturing our wigs to recyclers and use the proceeds to plant trees at our factory grounds. 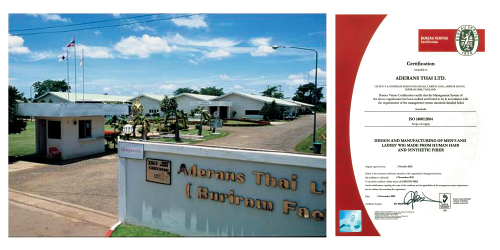 In 1999, the Group's production facilities in Thailand acquired ISO 14001 certification for environment-friendly operations. ISO 14001 substantiates efforts to protect the environment, and these facilities will continue to implement measures, as listed below, to maintain this status. 1.Prevent water pollution through factory effluent. 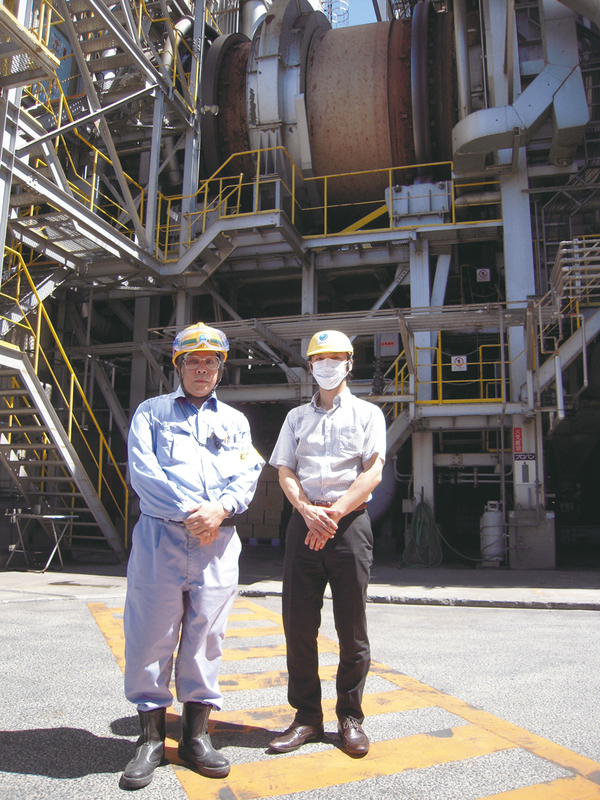 2.Prevent air pollution within the factory. 3.Safely dispose of industrial waste. 5.Improve working conditions within the factory. "Scalp Guard Orgarich" is ECOCERT, world standard organic certification institute, certified product launched in 2016. We adopted materials that aim for a recycle-oriented society in both components and package. However, we do not use genetic modification for plant component. Aderans has installed hand-held showers with water-saving attachments at salons where staff has the expertise to offer barber and hairdressing services. These showers reduce the amount of water used and lead to less CO2 emissions because there is less water to warm and thus less energy expended in that process. 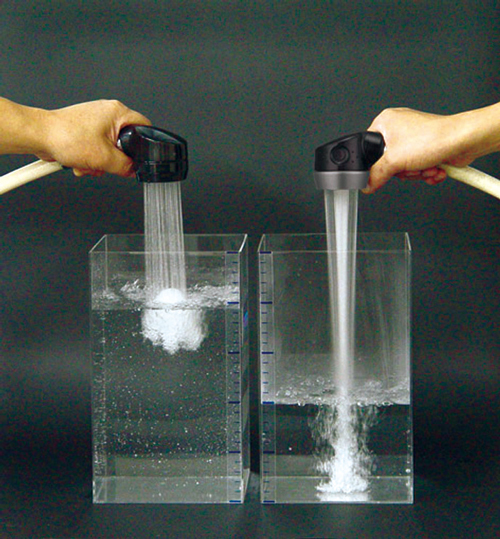 The showerhead has a smaller diameter than that of conventional models, which increases pressure and potentially shrinks water usage by 50% over typical hand-held salon showers. In addition, vitamin C is put into the cartridge to neutralize chlorine, which makes the water less harsh on exposed skin, not only the customer's scalp but also the hands of employees. shower has been installed at more than 150 salons nationwide, contributing greatly to reduced water usage and also shortening the amount of time under the shower. In order to respond to the nationwide power shortage due to the Great East Japan Earthquake, the Aderans Group has been making company-wide efforts throughout the country to push further energy conservation measures, such as switching off lighting at intervals, adjusting the times of air conditioning, and promoting “cool biz” in the office, other than at shops. We also have posters put up everywhere calling on employees to turn off the lights during lunch break and in areas where it may not be needed, in an effort across the Group to cut back on power usage. 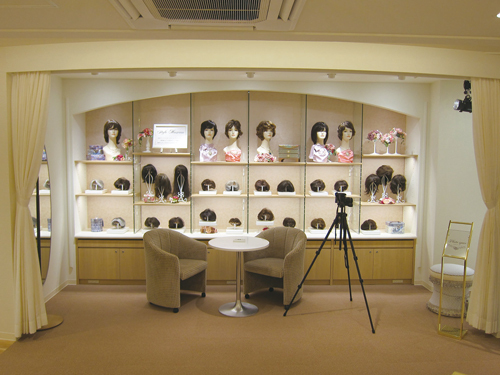 At our salons for females, we have been installing a "Style Museum" in which wigs are shown with huge varieties in styles for our customers to find their ideal hairstyles. We also attempt to minimize environmental impact at our stores byreducing power consumption such as converting lightings to LEDs at store renovations and construction of new stores. For stores utilizing LEDs"Style Museum"
By introducing the new mold making system, we actively manage to be environmentally friendly since we can reduce the amount of fitting materials. It also leads to the reduction of power usage because both domestic and internationaltransportation of those objects are no longer required. Handling Policy of Specific Personal Information, etc.